Southern Charm Traditional Wear And Yellow Rose Realty Have Teamed Up To Have The Perfect “Southern Charm Vacation Giveaway”!!! 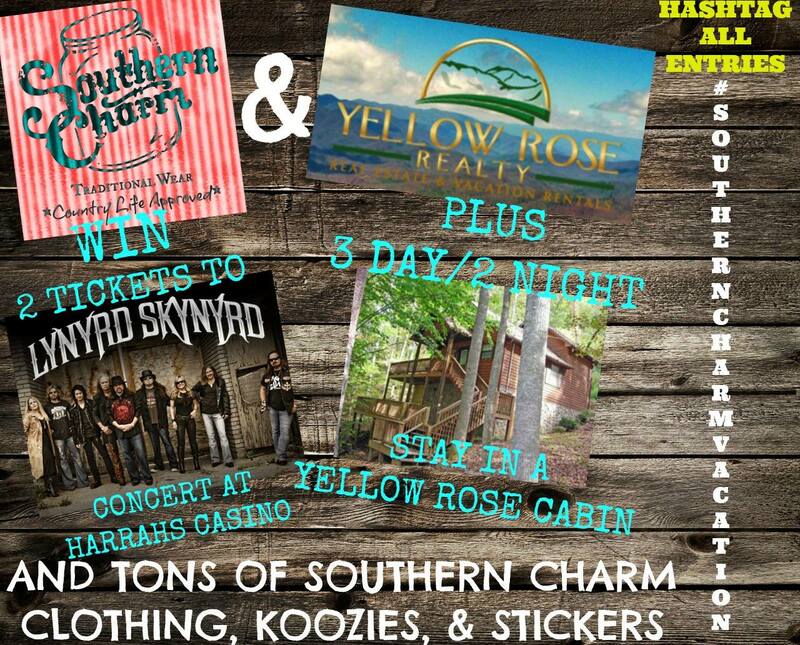 One lucky person will WIN a 3 day/2 night Stay In A Beautiful Cabin In The Smokies From Yellow Rose Realty, Plus 2 FREE TICKETS to see Lynyrd Skynyrd at Harrah’s Cherokee Casino Resort on Oct. 11th, And A TON OF NEW GEAR FROM SOUTHERN CHARM!!! This Is The Ultimate Giveaway So ENTER NOW TO WIN!!! Visit Southern Charm Traditional Wear on Facebook to enter to win these great prizes!